TelVue Connect has an optional feature that leverages IBM Watson’s speech-to-text algorithms to automatically generate timed Closed Caption files for videos: WebVTT for CloudCast VOD and OTT streaming, and 608/708 for broadcast. Open the Media Edit page. Scroll down to the Closed Caption section at the bottom of the Assets Tab. Click the Icon under Actions to begin the process of generating a closed caption file. Conversion of the resulting timed text file to the WebVTT formal commonly used in VOD streaming. 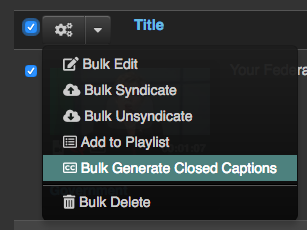 Once completed, the Closed Caption file will automatically be attached to any video included in a CloudCast player. 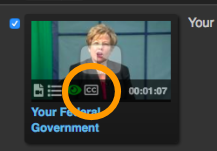 To view the captions, the viewer needs to start the video, and then select the CC option in the CloudCast player. The Closed Caption file is available for download from the Assets Tab. The accuracy of any closed caption file depends on the clarity of the speech in the video. If necessary, a closed caption file can be improved with manual editing and re-timing. First, download a preview version of the video from the Assets Tab in TelVue Connect. Download the captions file from the Assets Tab in TelVue Connect. Upload the preview video and import the captions file to CADET, and these will be displayed side by side. You can then edit the text in the individual caption cells. You can also re-time the in and out points using some simple keyboard shortcuts, as the preview video plays. Refer to the CADET documentation for details. Re-export the revised caption file. Re-upload in the Media Edit page in TelVue Connect via the Closed Captioning File – Choose File button. The revised captions will replace the previous file, and will now play out in CloudCast and be available for Broadcast transcodes. Users can track the usage of their captioning hours at Admin → Reports → Caption Generation Usage Reports. The TelVue Closed Captioning service can be purchased in blocks of 100, 500, and 1,000 hours. Please contact sales@telvue.com for pricing.